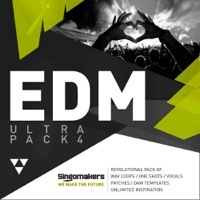 Singomakers are back with volume 4 of their Ultimate bestselling series - EDM Ultra Pack. 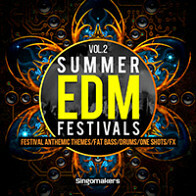 In this almost 3,06 GB library you will find everything you need for EDM music production – Powerful One shots, Phat Bass Loops, Melody Loops, Drop Sounds, Drums, Multi Kits, FX, Patches, Vocals, Templates, Tutorials and unlimited Inspiration! 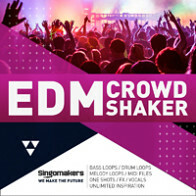 Within EDM Ultra Pack 4, Singomakers have mixed together a huge range of Dance genres from Modern EDM, to Classic Progressive House, with some elements from Future and Diablo House, Wobble House, Bigroom, Tech House and many more! Inspired by artists like KSHMR, Jewelz & Sparks, Don Diablo, Dannic, The Chainsmokers, Blasterjaxx, Hardwell, Swanky Tunes, Kill The Buzz, Ummet Ozcan, Tujamo, Martin Garrix, Axwell, Galantis, Tom Staar, SICK INDIVIDUALS, Quintino, Jay Hardway and many more. 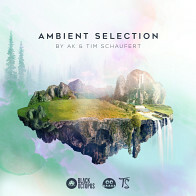 All samples in this pack are oversaturated by energy and have been processed by HQ studio equipment like Avalon VT 747, Manleq Passive EQ, UAD-2, LA2A compressor, hardware synths like Moog Voyager, Virus TI, Korg MS2000, and mixed at professional studio on Focal Solo 6 BE and Dynaudio bm12! 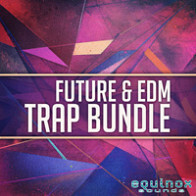 Also, contained inside the Full Pack formats (Full Zip, Ableton Pack, Apple Loops Pack and Reason Refill) is a special PROMO folder including a secret link to free samples from Singomakers as well as a special DISCOUNT CODE on our HOT and Top Rated VST plugin “Magic Stereo” which is actively used by Hardwell, Flosstradamus, W&W, D.O.D, Dannic, Futuristic Polar Bears, Swanky Tunes, Bart Claessen, Joachim Garraud, Rezone, Maddix, and a lot more! Check out the demo track and don't miss your chance to update your sample collection with this powerful library! The Following End User License Agreement is included with EDM Ultra Pack 4. This License is only valid for the individual who has purchased an unopened, new and lawfully made copy of EDM Ultra Pack 4 from a dealer or distributor authorized by Big Fish Audio.